Trinity College is Ireland’s oldest university. It was founded by Queen Elizabeth I in 1592. Due to its picturesque setting and the famous people connected with it – Oscar Wilde studied here – Trinity College is one of the city’s main tourist attractions. The Trinity library harbours the world’s most famous early medieval manuscript, the Book Of Kells. Trinity’s campus is located in the centre of Dublin and its impressive 47 acres feature cricket and rugby pitches as well as tennis courts. As one of the oldest universities in the British Isles, Trinity College is a symbol for the importance of Dublin as an economic and political powerhouse in Elizabethan times. Originally set up in 1592 for the education of the protestant elite, Trinity opened its doors to Catholics in 1793. The college first admitted women to its courses in 1904. The majority of buildings on the Trinity campus date from the 18th century, when a significant building programme created the elegant yet understated look that is now synonymous with the Dublin university. Trinity College is the only Irish university to rank in the top 100 world universities and amongst the top 50 European universities, as rated by UK newspaper The Times. 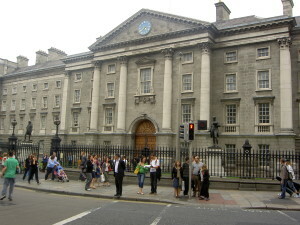 More than 15,000 students were registered at Trinity College in the 2007-08 academic year. More than 82,500 Trinity alumni were spread over the globe by early 2009. The university’s annual Trinity Ball is one of Dublin’s major social events and ranks among the most lavish student nights in Europe. The most precious single item on the Trinity campus is undoubtedly the Book of Kells. The book is an illuminated manuscript from 800AD which is housed in the Old Library building of the university. The manuscript contains the four gospels of the New Testament. It is the imaginative use of figures and complex ornaments to highlight the first letter on a page that makes the Book Of Kells so special. Incredibly vivid and colourful even 1,200 years after they were drawn by monks, these illuminated letters have come to define much of what we know these days as Celtic style. A librarian turns over a new page of The Book Of Kells every day. SO if you come here for a year, you would get to see the entire manuscript. Alternatively, you can buy the Book Of Kells on DVD. It is a must have for anybody interested in graphic design, typography or medieval art. Apart from the Book Of Kells, the Old Library is worth a visit for its magnificent Main Chamber. The 65 metres long hall houses 200,000 of Trinity’s oldest books. With its ancient wooden shelves, alcoves and vaulted ceiling it looks just like a picture perfect library. Also on display in the Old Library at Trinity is one of the dozen or so remaining copies of the 1916 Proclamation of the Irish Republic, which was read out aloud by Patrick Pearse outside the General Post Office on 24 April 1916 at the start of the Easter Rising. 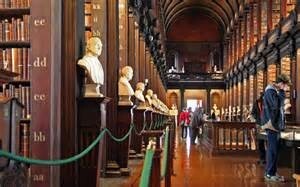 The Old Library at Trinity College is open Monday to Saturday from 9:30 to 17:00 and Sundays from 9:30 to 16:30. In the winter months, the Old Library opens at 12:00 noon on Sundays. On Irish Bank Holidays, the library usually stays open from 9:30 to 17:00. The entry for adults is €9.00, children under 12 years of age go for free. Concessions for families, students, senior citizens are available. 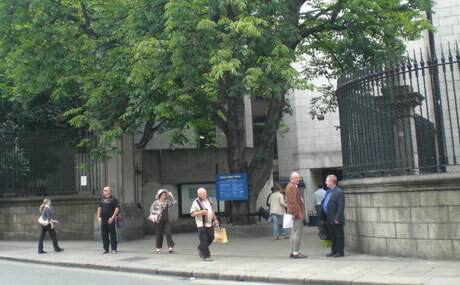 The Douglas Hyde Gallery is located adjacent to the Nassau Street gate into Trinity College campus. The gallery’s stark, modernist architecture is a fitting frame to the cutting edge contemporary art exhibited on its two floors. The Douglas Hyde Gallery has no permanent collection. Instead, exhibitions change frequently to reflect trends in contemporary arts. The Douglas Hyde Gallery is open Mondays to Fridays from 11:00 to 18:00, Thursdays from 11:00 to 19:00 and Saturdays until 16:45. The gallery is closed on Sundays. Entry to the Douglas Hyde Gallery is free of charge. The Oscar Wilde Centre is a resource centre for international and Irish writers interested in developing their knowledge of Irish literature. The centre offers a M.Phil degree in Irish Writing and an M. Phil in Creative Writing. The centre is located at the former Wilde family home on 21 Westland Row, adjacent to the Trinity campus. Dublin’s newest visitor attraction is the Science Gallery, which opened its doors in February 2008 on two floors of the Naughton Institute on the Trinity College campus. Exhibitions typically feature hands on visitor participation and are great fun for kids and adults alike. Initially, Trinity College expected to attract 50,000 visitors to its newest public attraction in the first year. The Science Gallery proved more popular than expected, with some 120,000 curious sightseers flocking to its exhibitions. The Samuel Beckett Theatre is the campus theatre of Trinity College’s Department of Drama. During term time, the theatre showcases works by the Department and its courses. In the summer months and during breaks, the theatre’s stage hosts visiting dance and theatre companies from all over Europe, Japan and the United States. The Samuel Beckett Theatre also participates in the Dublin Fringe Festival and the Dublin Theatre Festival. Trinity College offers walking tours of its historic campus during the summer months. Tours depart from a desk located in the Main Gate of the College and last approximately 30 minutes. The tour will give you an overview of the history of Trinity College, its architecture, its most famous graduates and includes an optional visit to the Old Library and the Book of Kells. The campus tour on its own costs €5.00 per person; together with a visit to the Old Library you pay €10.00. Tours depart every 40 minutes between 10:15 and 15:40 from mid-May to September. Trinity College is located just off the Northern end of Grafton Street, with the main gate located at College Green and side gates on Nassau Street, Lincoln Place and Pearse Street. The closest Dart stop for Trinity College is Pearse station, which is convenient for both the Pearse Street and Lincoln Place entrances. The 128 bus goes from the Connolly stop on the Red Luas line to Nassau Street, a five minute walk away from the university. The 92 bus brings you from Heuston station to Trinity College. 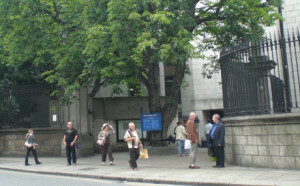 The 123 bus from Dame Street/O’Connell Street stops at College Green, opposite the main gate to Trinity College.